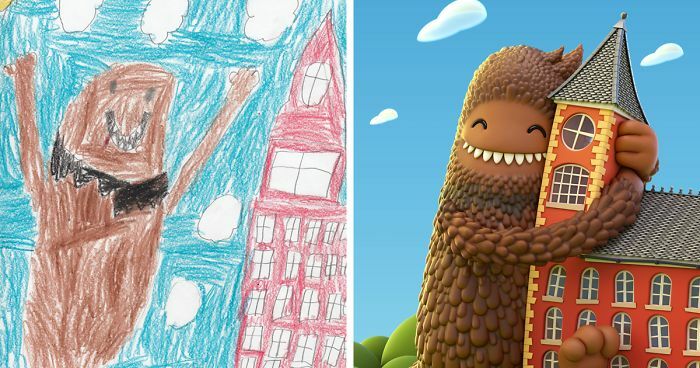 Last year we introduced you to The Monster Project, an awesome initiative that sees professional artists adding their own unique touches to monster doodles created by kids in elementary. Well now we're bringing you more of their amazing collaborations, and as you can see below, the results are quite spectacular. Based out of Texas, the purpose of the project is to encourage creativity and provide inspiration for artistic children everywhere. "With a decreasing emphasis on arts in schools, many children don’t have the opportunity for creative exploration they deserve," reads their website. "That’s a monstrous trend we would like to destroy. As artists ourselves, we understand how important that initial creative exposure is and how it can truly alter the shape of a child's future. Creativity comes in many forms, and we hope to encourage their exploration of their own unique perceptions of the world we share." Vote for your favorite pictures below, and check out their website for more info. it's poop and toilet paper. On the right this is not his ear it's his nose! I really like this one, you didn't change a lot. I like the art on this one. Oh my god, that's cool. And people wonder why we have dragons and unicorns and Baba Jaga. Not a mystery at all - look at what human imagination does in its earliest endeavors. This is just an improved Snapchat logo. This artist's version has been somewhat sanitised. In the original, the three eyed monster has pulled the eyeballs out of a bloody, decapitated head. o_O Nice kid! Needs therapy! I can't help but want to ruffle the fluffle of this adorable demon creature. I think the kid wants a more detailed and highly textured character? Direct translation work, no communication with kid. Artist is simplifying the atmospheric interpretation I feel. Where's the sun? This is just taking the original creature and slapping it onto the picture at the bottom. Ok, but seems not much communication achieved on the story of the character. Missed out on the musical setting, but seems artist is able to interpret storyline of the kid otherwise. Missed out a character in the foreground.. This has turned from battling an evil pencil to a happy-go-lucky picture for 2 month old babies. Artist made it less absolutely freaky, hahaha.